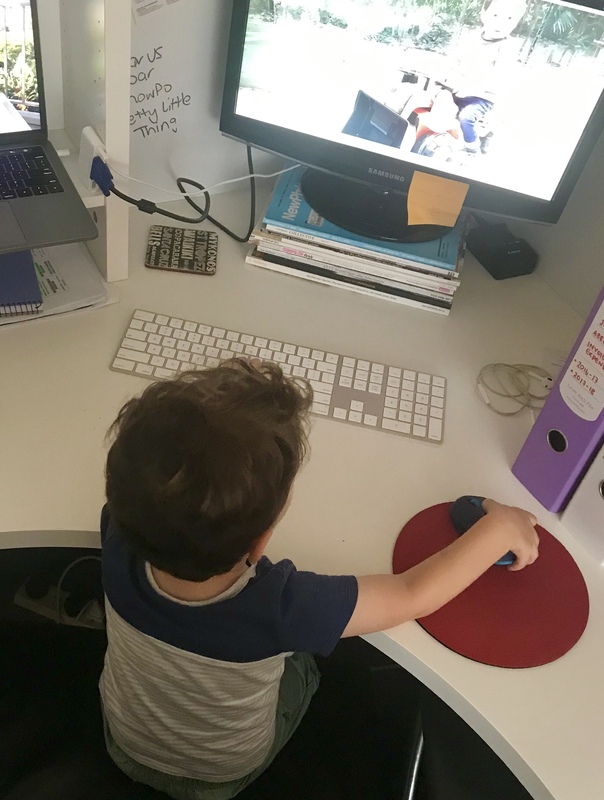 Yesterday morning as I was pottering around the house, cleaning up after the weekend and starting to create some sort of ‘order’ around the mess my son continually makes, I turned around to find our little cherub sitting in my office chair at my desk. When questioned what he was doing, he simply stated that he was ‘sitting at his desk, working’ like it was the most normal thing in the world. The thing is, for him, it is the most normal thing in the world. I started working again when he was four months old. All he can remember is that daddy goes to an office to work and that mummy works from the desk at home. In fact, whenever I drop him to kindy he always tells me that I need to go home to do my work. Having two working parents is something I really want for my children. Of course, it has to be the balance of work that I can still be there for my kids – hence my writing career. But it’s so important that my children see that both parents have an equal role in our household. Really, it’s history repeating itself. My sister and I grew up with two working parents. My dad ran a business and my mum was a school teacher. My dad was, and still is, also heavily involved in community work. So, while there were times when we didn’t see our dad before we went to sleep, he was always there when we woke up. And our mum was always there after school for us. Being a teacher at the same school we attended meant she took us and brought us home each day. While being a teacher, of course meant the hours were fantastic for her young kids, we still understood that our mum was working. Often, she would have report cards and exercise books sprawled out on the dining table as she marked her kids’ work after dinner, while we sat aimlessly in front of the television winding down after a long day. Hard work was something my parents always instilled in us. They taught us that we could have and be anything we wanted, but that the only way to get there was to put in the hours. We were taught from a young age that a mother’s career is just as important as a father’s. And I will forever be proud of the impact my mum had on thousands of children. Also, let’s face it, I didn’t spend six years at university to not utilise my two degrees. And according to all the reports, children who have working mothers actually do better in life. Winning! According to a Harvard Business School study, daughters with working mothers are better educated, and sons with working mothers do more housework and grow up to share the childcare duties. To me, this makes sense. My son sees mummy working on weekends when necessary. He sees daddy cooking dinner at least once a week. He sees both mummy and daddy cleaning up, and both mummy and daddy doing the kindy drop off and pick up. He sees, for the most part, an equal playing field. The fact that both mummy and daddy are in the kitchen is so ingrained in my son that he often pulls his chef outfit on and tells us that he’s making dinner. Excellent! I wonder when I can actually put him to work in the big kitchen? I love that my son understands that mummy works. I love that he sees both of his parents contributing to his home life. I love that when mummy is working on weekends, he gets quality time with his daddy, which both of them completely relish. I love that when mummy goes away for work, my son feels complete control because he knows his daddy is there and that his daddy can handle absolutely anything kid-related. I think it’s so important that my children see that I have a life outside of being their mummy. And while my kids will continue to be my whole world, it’s so important that they see there is still a little place for myself and my career there too.